We hear it over and over again……”If you just eat healthy, your life will be so much better!” Wonderful…..what does that even mean? And where do I start? And the same noisy confusion exists in the stores where you shop. There is an endless sea of bottles on the shelves of your local healthfood store. A search on Amazon for “protein powder” yields a staggering 10,000 results. How could something as simple as getting good nutrition be this difficult? And all the while, you’re caught in between this wall of confusion and the very real demands of a busy life, with career, family, and social activities occupying the majority of your time and energy. These two opposing forces become the obstacle that prevents you from achieving your health goals. Twenty years from now, you won’t be able to roll back the clock and do it over. If you feel like you need help, I want you to know that you don’t have to go it along. We’re here to help you. We believe that better health starts with knowledge and the right support. Before the world became so noisy with blogging, tweeting, and social sharing………there was another community that existed offline. This community believed in educating and empowering others to take charge of their own health. If you walked into a healthfood store 20-30 years ago, you would have likely been greeted by the owner of that store. And there was strong accountability for that shop owner to give you honest, straightforward advice and treat you with care because they were a member of your community – a neighbor, a friend. I know because, as a young man, I grew up watching my parents help people in their small healthfood store in Maplewood, NJ. I learned from them and, growing up, began helping customers in the store myself. The people who came to our store were more than just customers to us – they were our friends. We cared about their health and wellbeing as if it was our own. The desire and ability to impact peoples’ quality of life is a gift my parents passed down to me and it’s something I will be grateful for forever. In fact, that experience growing up shaped a philosophy that I call “advise, don’t advertise”. This simply means that our first priority should not be to push products on someone, but rather to focus on helping them understand and solve their problem. 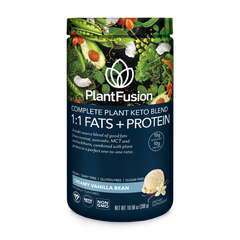 We carried this philosophy forward with PlantFusion, a line of simple easy-to-use snacks, shakes and supplements that are both great tasting and nutrient-dense. 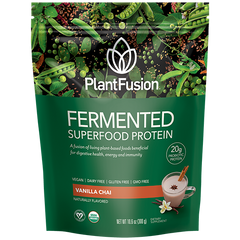 The team of people that we’ve assembled to create PlantFusion brings together two very different but important cultures. We have people with advanced degrees in nutritional science working right alongside those who have a strong culinary background and foodie sensibility. This diversity of knowledge and expertise working together is what makes the magic happen. And we want to share some of that magic with you in this blog and a series of videos that we’re launching this year. Flavor Pure: is all about taste – we’ve developed a method for blending natural organic sweeteners, flavors and texture enhancement in a way that you won’t find in any other nutritional supplement. Select Source: better nutrition comes from better ingredients – our unique process evaluates hundreds of garden-fresh ingredients from around the world to select the most nutrient-dense. Our Purity Promise: we guarantee purity by overseeing every step of the production creation process at our own triple-certified facility right here in the US. Honestly, most of the people who use our products probably don’t even know about Flavor Pure, Select Source, and The Purity Promise. They just know that the product tastes delicious and they feel better when they use it. And that’s all that really matters to us. Your health is important. Don’t feel like you have to take the journey alone. We’re here to help you. The knowledge you need to make better choices – up to the minute information about the newest ingredients and simple health tips that can change your life. The support and inspiration to achieve your goals - we have a whole community of people just like you who want to succeed together. Plus, a licensed nutritionist on staff. Call us, email us, or connect on social.